Recently, scientists using data from NASA's Mars Science Laboratory mission confirmed something that has been suspected for some time: the floor of Mars' Gale Crater and the foundations of the mound of sediments that sits within it—Mount Sharp—were long ago the bottom of a lake of water that may have been present for as long as 500 million years. The rover Curiosity landed in Gale Crater, near the foot of Mount Sharp, three years ago. After prospecting the geology of the crater floor for almost two years, the robot began making its way up the lower slopes of the mountain, sampling the chemistry and morphology of its sedimentary rock layers and building a picture of the crater's early—and now verifiably watery—history. Over the last year Curiosity has encountered rock formations that suggest the past action of flowing water: large-grain gravel deposits that indicate fast-flowing streams or rivers, and other formations that suggest locales where streams emptied into pools. These signs of past flowing water sent mission scientists looking downstream, where common sense promised we might find a lake formation, an accumulation of fine-grained silts and muds built up over time at a lake bottom. Gale Crater, after all, was a deep impact basin, with no outlets through which water flowing into it might escape. And that's just what Curiosity has found, in the form of mudstone. 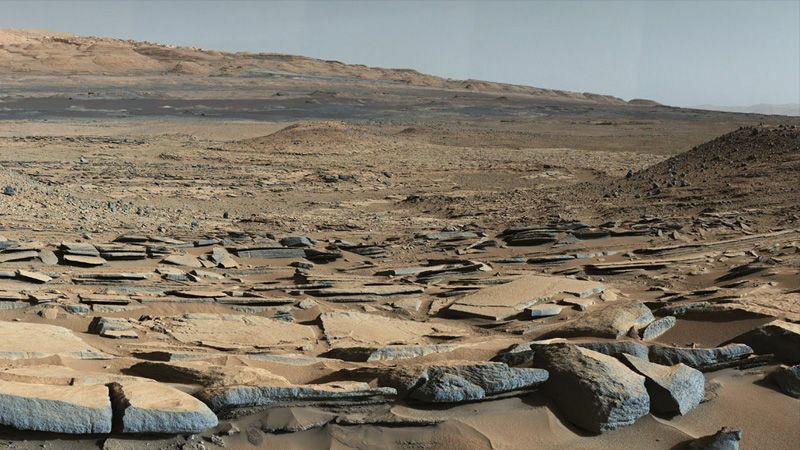 One prospecting site along Curiosity's path, called the "Kimberley" formation, shown in the picture at the top of this post, is a beautiful example of these mudstone layers, the telltale geological legacy of a long-enduring body of water. The story told by the lower level mudstone strata is that between 3.8 and 3.3 billion years ago the 90-mile-wide impact basin hosted a lake, either continuously or in repeating cycles of wet and dry climate. The water may have been supplied by the inflow of rivers and streams, or the runoff of melting snow from surrounding highlands, or a combination of these. Eventually, the crater basin filled in with deep layers of sediment, which were later sculpted by erosion to form the central mound of Mount Sharp, Curiosity's current digging grounds. When Did Mars Start to Dry Up? Measurements of Mount Sharp's higher slopes, whose layers represent more recent sedimentation, show no signs of past association with liquid water, and might be explained as wind-deposited material. 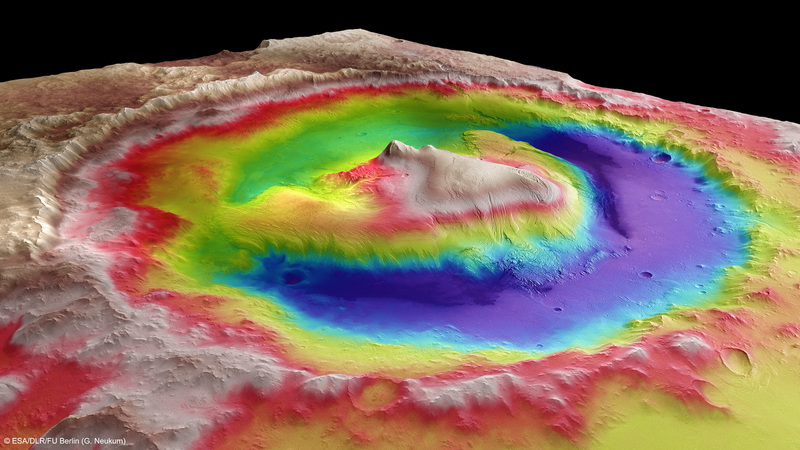 This dramatic change tells us something we already knew: that the wet conditions of Mars' youth eventually dried up. As Curiosity climbs toward these higher, historically drier layers, we may learn more about when and how Mars began to change into the world we know today. But perhaps Mars has not dried up completely... . The news of Gale Crater's ancient lake bed followed closely NASA's recent announcement confirming the action of liquid water on Mars at present. 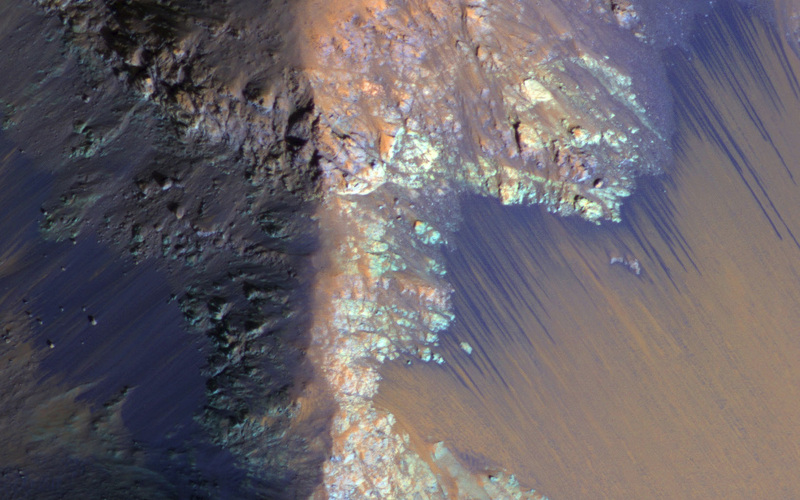 NASA's Mars Reconnaissance Orbiter detected hydrated mineral salts in transient dark streaks observed running down the inner slopes of low- and mid-latitude crater and canyon walls. These streaks, called recurring slope lineae, have been observed from orbit over the past few years, appearing during the warm seasons in Mars' northern and southern hemispheres, and disappearing in the cooler seasons. The spectroscopic data from the orbiter confirms what was suspected: that the dark streaks are most likely caused by flows of briny liquid water, on or just under the surface. Could Curiosity's Wheels Get Stuck In The Mud? Could Curiosity's wheels, now treading over the dry mudstones of Gale Crater's paleo lake bed, ever encounter actual wet mud? Are there any recurring slope lineae in the vicinity that NASA could send the rover on a spin through? Scientists have been scrutinizing high-resolution imagery of the slopes around Gale Crater looking for activity. So far, researchers have seen no strong candidates, although they have spotted transient darkenings that match some characteristics of the brine flows—the most promising of these only about 30 miles east of Curiosity's present location. If Curiosity's operators could, I suspect they probably would consider making a detour to examine slope lineae up close. Imagine what we might find... . But 30 miles is a long haul even for the capable Curiosity—even if the rover could traverse whatever terrain lies between it and a candidate site. Added to the challenge is that the briny streaks are found running down fairly steep slopes, and they may be inaccessible to this robot. So the investigation of the environment around these transitory water seeps is probably the subject of a future mission to Mars. In the meantime, we can expect more fascinating reports from Curiosity as it climbs above the mudstone layers of Gale Crater's ancient lakebed, and sleuths out what may have happened to a once much more Earth-like Mars.